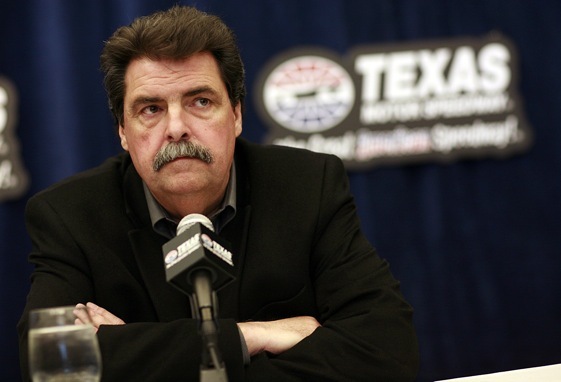 Fort Worth, Texas – NASCAR president Mike Helton says there is a “doggone good chance” that Sprint Cup cars will be sporting rear spoiler blades in place of their current raised wings at Texas Motor Speedway next month. That doesn’t necessarily mean the Samsung Mobile 500 scheduled on April 18 will be the first blade race for NASCAR’s Car of Tomorrow platform. The blade was first tested around TMS’ 1.5-mile quadoval by Cup regulars Tony Stewart, Kurt Busch, Greg Biffle and Brian Vickers during a Goodyear tire session on Jan. 19 and 20. Those drivers represented each of the four manufacturers competing in Cup. Meanwhile, an open-test on the 1.5-mile Charlotte Motor Speedway, a sister facility to TMS, is booked for March 23-24. That means NASCAR officials could OK the blade for races on the half-mile Martinsville Speedway on March 28, the 1-mile Phoenix International Raceway on April 10 and/or TMS. TMS president Eddie Gossage – who posed the blade question during an easy chair interview with Helton up on a stage at The Speedway Club – is convinced the April race here will be run with the blade. Furthermore, Gossage believes the aluminum blade – which at TMS ran 4 inches high and 64.5 inches wide – could upset the current balance of power enjoyed by Hendrick Motorsports, home to four-time and reigning Cup champion Jimmie Johnson, four-time champion Jeff Gordon and their Chevrolets. “If you look back, a few years ago, Jack Roush had all five cars in the Chase. He had none in the Chase last year,” said Gossage, referring to the Ford stable at Roush Fenway Racing. “So the tide had turned. And he’ll tell you that the difference is they didn’t develop the Car of Tomorrow as much as everybody else had. They were behind on the COT. So if somebody’s behind on this spoiler thing, then there could be a reversal of fortunes. If Hendrick is behind, let’s say, then Jimmie’s going to have a tough time. Jeff’s going to have a tough time. Johnson posted his second consecutive victory of the three-race season Sunday on the 1.5-mile Las Vegas Motor Speedway, another sister-track to TMS, thanks to a four-tire final pit stop that overhauled Gordon’s two-tire stop down the stretch. Asked about the most recent dominating performance by Johnson and crew chief Chad Knaus, Gossage said, “It hurts. It’s not good. By no means do I wish anything bad on Jimmie. I really like Jimmie, I think he’s a great champion. But I don’t care who the driver is, it’s not good for a guy to seemingly effortlessly win week after week after week. After an offseason of discussion with drivers, crew chiefs and owners, Helton said NASCAR teams have been “aggressively” testing the blade any time a Cup team has tested tires for Goodyear Racing. The idea is to improve passing and the quality of racing while preventing the COT’s boxy rear end from taking flight in the event of a crash. The COT, a product of NASCAR’s Research & Development Center in Concord, N.C., made its debut on the half-mile Bristol Motor Speedway on March 25, 2007. Among its new aerodynamic features was the raised rear spoiler in place of the traditional blade and a fixed front-end splitter in place of a valence. Asked specifically about the rear wing, Helton said, “There were some aero studies that we did as we were developing the current car that indicated that the wing might aid in the performance on the racetrack when you kind of tune the aero-push elements that you hear a lot about or the wake that a car would create as it would go around the track with cars behind it. And a lot of that still exists. I mean, the benefits of the wing may still exist. Helton said driver reaction to the change during testing has been mixed, and not unexpectedly so. “A lot of it’s mixed because it’s hard to come to a conclusion with a 10- or 15-lap run on different racetracks under different circumstances,” Helton said. “Any change we make, any step we take along the way, the proof in the pudding is we put 43 cars on the racetrack and run a 400- or 500-mile race. And in most cases it takes three or four of those. And oh-by-the-way, you also have 43 different personalities out there who like 43 different recipes of how their car should or should not feel. That’s part of the thing we have to manage, is collecting all that and then making a singular decision for the whole group. Cup regular Joey Logano, the 2009 Raybestos Rookie of the Year, said he was interested to see how the blade would affect his car in race conditions. “Particularly as we are in a cycle of challenging economic times you’ve got to get creative, you’ve got to help people, you’ve got to listen to people, you’ve got to suggest things,” Helton said. “I do feel good about our future and the reason I do is because we’ve got such a great infrastructure. And I’m not talking about NASCAR as a company based in Daytona Beach. I’m talking about NASCAR as an industry, a lifestyle, a conglomerate of racetracks and car-owners and personalities like the drivers and crew members that make NASCAR capable of being able to survive challenges like we’re all going through right now.